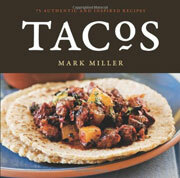 This taco recipe, which was published in a cookbook years and years ago, originally called for shark. Uh huh. That’s not happening for many reasons, among them the fact that we’re suckers for sustainability and shark isn’t on the Monterey Bay Aquarium’s Seafood Watch green list. You can use just about any firm, moist white fish that is a sustainable catch in its place. Chef Mark Miller suggests tilapia or the incomparably sweet mahi mahi (often known as dorado), although the commonplace Pacific-caught cod also works quite well. 1. In a large bowl, combine the cold water, lime juice, garlic, chiles, oregano (if using) and salt. Add the fish and set aside to marinate at room temperature for at least 20 minutes. 2. In a separate bowl, whisk together the ice water and mustard. Gently stir in the flour, being careful not to overmix the batter; a few small lumps are okay. Cover and refrigerate for 30 minutes. 3. Drain the fish and pat the pieces dry with a paper towel. Have a plate lined with paper towels at the ready. 4. In a large, heavy-bottomed pot, heat at least 2 to 3 inches of oil over medium heat until it reaches 360°F (182°C) on a deep-fry or candy or instant-read thermometer. 5. Remove the tempura batter from the refrigerator and stir once more. Dredge a few pieces of fish in the batter at a time, turning to coat them evenly. Gently drop 2 pieces of fish at a time into the oil, adding 2 more pieces every 30 seconds (fry no more than 4 pieces at a time). Fry the fish until the pieces are a crisp, light golden brown and floating on the surface of the oil, about 2 1/2 minutes per batch. Monitor the temperature of the hot oil throughout frying, letting the oil return to proper temperature, if necessary, between batches; to ensure crispness, it must remain a constant 360°F to 380°F (182°C to 193°C). If the temperature is too low, the fish will be oily; if it is too hot, the pieces will burn. 6. Using a fine-mesh skimmer, transfer the fish tempura to the paper towel-lined plate to drain. Repeat with the remaining fish and batter, being sure to remove any pieces of floating batter in between batches or the oil and your fish will take on a burnt taste. 7. Place the tortillas side by side, open face and overlapping, on a platter. (If using double the number of tortillas, simply double them up.) Divide the slaw and fish equally among the tortillas. Top with salsa and desired garnishes or allow guests to do so themselves. Grab, fold, and eat right away. These were delicious fish tacos! I used tilapia and would suggest marinating it for no longer than the 20 minutes. We thought the serrano pepper in the marinade would be too much with habanero in the salsa, but the mango and banana sweetened the salsa to a perfect balance with the crunchy Baja Cabbage Slaw. This will definitely stay in my summer file for entertaining. Everything but the fish can be made ahead of time. Delicious. These are great all on their own, with the basic slaw. Adding the Banana Mango Salsa takes things to a new dimension! The crispy tempura coating plays off of the crunchy Cabbage Slaw, and the flavour of the marinated fish complements the salsa to create a fulfilling (and filling) result. Just the slightest squeeze from a lime wedge makes this a soft-taco sensation. If you decide to use the salsa with the tacos, you may want to consider passing on the garnish of extra jalapeños. A note on the batter: There’s definitely a difference between U.S. and Canadian flour, as I needed an extra 1/4 cup of water to thin the batter to start, and another 2 to 4 tablespoons to thin it after the 30 minute sitting time. These were wonderful fish tacos, loved by all. Because I’m trying to maintain a low-fat diet, I made them a bit differently: I used a thick piece of fresh halibut, which held up well to the marinade, that I broiled rather than fried. My favorite part of this dish is the Mango-Banana Salsa. I can see putting this on a variety of grilled fish, or just serving with some chips. Another great thing about this dish is that you tailor the heat based on how hot or how mild you like your food. We tend to err on the medium side of things, so I chose a mild pepper for both the salsa and the fish marinade, as well as adding just a small bit of Tabasco in the coleslaw. These fish tacos equal yum in the mouth. They’re not a weeknight food due to the length of time they take to make, but they’d make a great weekend dish the whole family could help with. I peeled my mango the way I normally do, but the fruit was so ripe that I ended up with mushed mango instead of the pretty little dice stated in the ingredients list. There should also be safety tips for handling the habanero chile. I typically wear gloves when fabricating super-hot chiles, and my hands still burn anyway, so a novice could end up with serious burns if proper instruction isn’t given. Other than these few things, the Baja-Style Tempura Fish Tacos are right up there at the top of my list of favorite recipes to share with the people I love. Baja-Style Tempura Fish Tacos Recipe © 2009 Mark Miller. Photo © 2009 Ed Anderson. All rights reserved. All recipes and photos used with permission of the publisher. Made these for family fun night last Friday… Kids (7, 11) loved them! Used Mahi Mahi… Tempura batter was crispy and delicious. Both the salsa and the slaw were gobbled up! Will definitely make again. So glad you liked these Karin, these are my go to fish tacos every time, the salsa and slaw are both so easy to whip up. It is a temptation to eat that lovely fish right away, Ruthie, but the tacos are worth the wait. Try it, you might like it!